I made this Postman Pat Birthday Cake for my son’s 2nd Birthday (He is now 20!) as he used to watch Postman Pat all the time. 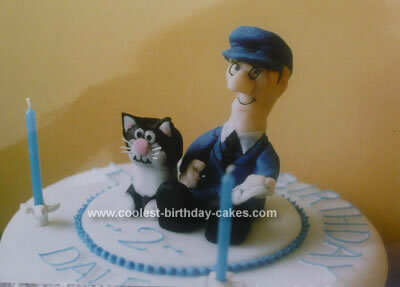 I made Postman Pat and Jess out of sugar paste which I coloured by kneading in colouring paste. I used some cocktail sticks inside his head and arms to hold them in position whilst the paste dried. Pat’s glasses and Jess’s whiskers were made from fine wire, usually used to make sugar flowers. It probably took a week before the models were properly set, so I made them in plenty of time before I made the actual cake. I coated the 8″ Madeira cake with sugar paste and made a plaque to place the models on to. I then used a blob of Royal Icing to stick them on to the plaque. Finally I piped the lettering and added two candles. My son loved that cake and still refers to it now!